Published in 1997, Limited edition sold out. Collectors Series prints available. 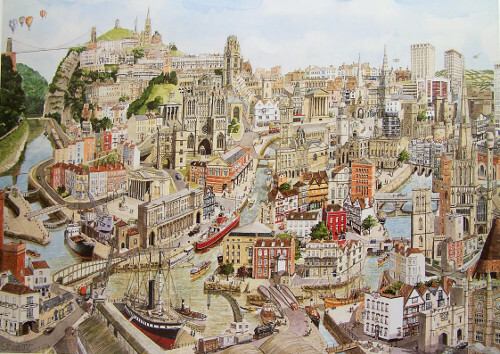 A Bristol painting was always going to feature high on my list of cities as it represents happy memories from my childhood. I was taken by my father to the Zoo several times and remember standing nervously on the Suspension Bridge looking at the cars and people far below. I still react to heights with that nervous feeling in my stomach. I reacquainted myself with the city for the Bristol cityscape in February 1997, and as usual returned home with loads of photos, plans and books to start working out the composition. The pencil drawing, inking in and finally the watercolour were complete by July, and the Bristol prints were published later that month. Fortunately I was able to tell my father about the completed print, one month before he passed away. The composition includes the River Avon and Gorge, Suspension Bridge and Clifton including the terraces, the Cathedral, Park Street and Wills Tower, Brunel House, Victoria Rooms and Royal West of England Academy, parts of Spike Island, Queen Square, King Street, Corn Street, Broad Street, Christmas Steps, The Castle ( rebuilt), medieval Bristol Bridge, St Mary Redcliffe, two shot towers several historic Bristol pubs, SS Great Britain and the Matthew. In fact, this my first Bristol painting contained much more!